Maintaining a face down position is crucial to the success of the surgery. Because this position can be difficult for many people, it is important to discuss this with your doctor before surgery. 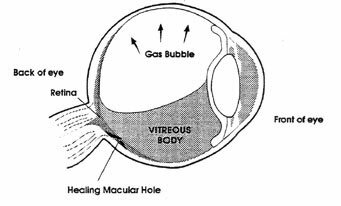 The gas bubble rises to top of eye and seals the macular hole. 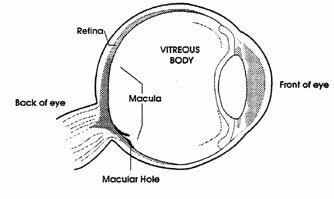 Pressure against the hole flattens the macula against the wall of the eye and the impaired visual area is minimized. 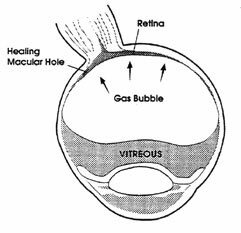 During the 1-6 week recovery time, the afflicted eye will heal, the macula will re-bond to the eye wall, and a new vitreous fluid replaces the gas bubble. Click here for a video explanation on why face down recovery is a requirement.